Eileen owns and runs Effective Event Management, a multi award-winning company based in Vancouver. She brings extra skills to an Emcee position, having been a script writer, event director and stage manager for over twenty years. 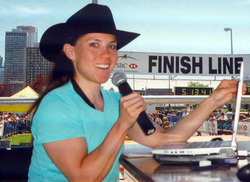 As an announcer, she has worked both sporting events and galas, and knows how to gain and keep an audience’s attention. Eileen has a keen eye for the little things like camera angles, photo ops, sponsor branding, crowd control, stage access, and traffic flow when it comes to fine tweaking a stage in any location. In addition to being able to command an audience in English and in French, Eileen takes responsibility for keeping proceedings on-time and on target, juggling multiple presenters, personalities, and activities. This requires a high degree of organization, communication skills, energy, stamina, flexibility, enthusiasm, and spontaneity.